We catch up with Sam to ask if a shrinking surf industry is good for the environment and whether product innovation or radical lifestyle change have a better chance of solving the world's pressing environmental issues. Hoots erupted from from headland as the wiry frame of Sam Boex emerged from the bowels of solid turquoise keg, lit perfectly by the low winter sun as it drained across Cornwall’s premiere stretch of reef. ‘That was a fun one’ Sam recounted modestly a few days later of the wave many were calling the best of the day. After a memorable week of swell at his local, he was back behind his desk at his Porthleven studio, giving the world its first look at a project him and his brother had been working for the last 18 months, which was set to make headlines, set comments sections buzzing, and possibly, change the way surfboards are packaged for ever. Like many of Cornwall’s most talented surfers, Sam enjoyed a brief stint travelling around the world during the industry’s early naughties financial boom, however, after a few years, he peeled off his stickers and steered his hand to another of his passions, setting up a commercial interiors company called ‘Boex’ with his twin brother, Will. Earlier this week the pair unveiled their brand new venture; Flexi-Hex, which aims to tackle the excessive amount of plastic packaging used in surfboard transit by offering a more environmentally-friendly alternative. 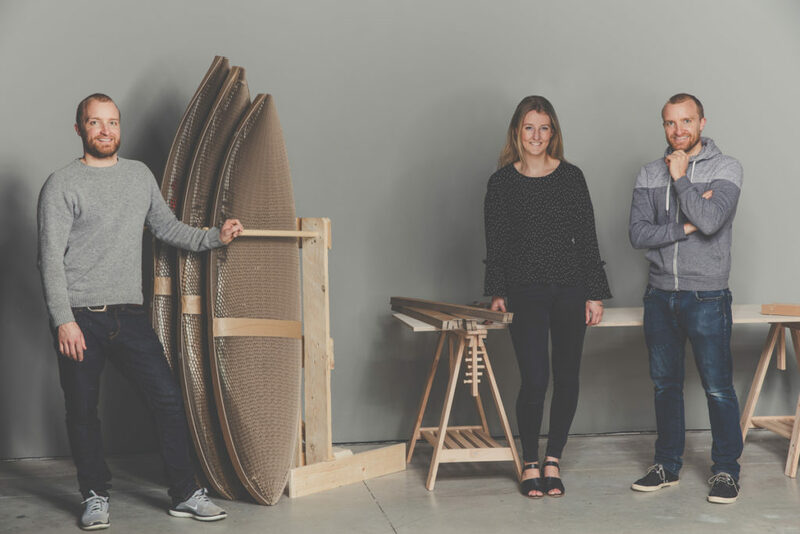 Their creation utilises a flexible hexagonal mesh, made of bio-degradable, recyclable cardboard, to provided a quicker, safer and more aesthetically pleasing surfboard packaging. It’s been being trialled by local companies including Fourth and Skindog surfboards for a while and recently become available for regular punters to buy to protect their boards on long-haul flights. We caught up with Sam recently to talk about his time as a travelling surfer, the product and how small innovations hold the key to solving the environmental issues of the future. Hey Sam. First, can you tell me a bit about yourself and your surfing career. I was sponsored till about the mid 2000’s, and I didn’t surf professionally but I had quite a lot of trips paid for. At the time I was juggling surfing, which was my passion whilst exploring other other creative outlets, I ended up focusing on design which lead to the career I’ve ended up in. And was there much talk of environmental issues within surfing at that time? I think there’s always been an awareness among surfers because you’re faced with the effects of pollution in the ocean on a daily basis, so it’s not just a theoretical issue. 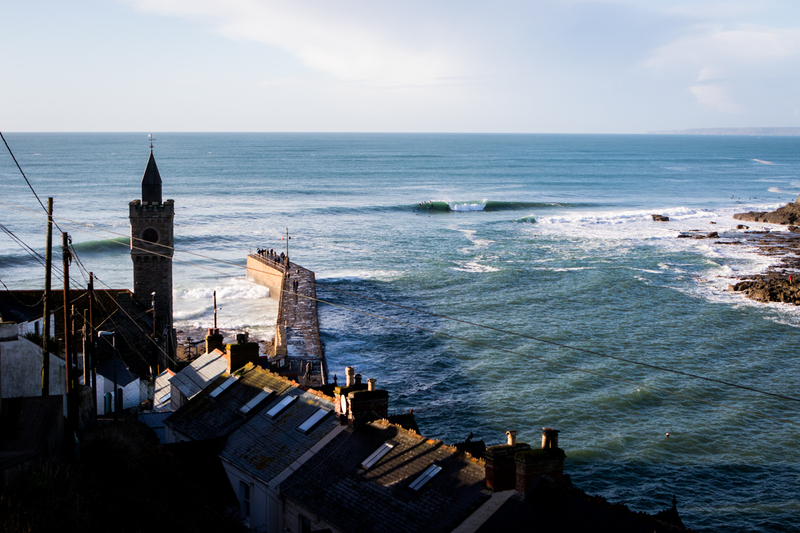 In Porthleven, before the treatment centre was built, surfing during heavy rainfall was evidence of the shocking reality of what was going into the ocean, with anything and everything being discharged into the water. SAS paved the way to show that small organisations could have a big impact with passion and vision. But at the same time there was a feeling of a slight helplessness, because back in those days the industry was made up of a few large companies. You felt like you were just a pawn, and trying to make a change seemed too much of a mammoth task. Obviously the surf industry, in Britain and globally, has shrunk quite a lot since then. Do you think that has given individuals more of an oppurtunity to affect change? Definitely, brands like Finisterre were started in our generation, and now everyone is looking at businesses like them and the effects they’re having. They’ve shown that you can actually make change. Where as, early on in the 2000’s, the majority of the surf industry was corporate brands, that were coming in from Australia and the US, and they had these impenetrable barriers. It was all just product arriving, rather being able to communicate with the people involved. It’s better now because it’s in the nature of how smaller companies work that they’re a bit more in touch with people and have more responsibility. 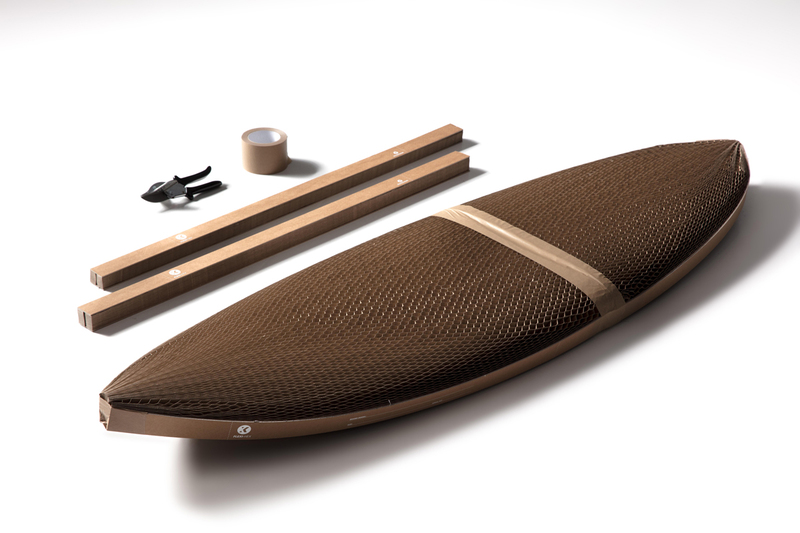 You’ve just hit the headlines with the Flexi-Hex, which is your new more environmentally friendly alternative to the plastic packaging which surfboards are shipped in, is it your first venture into environmentally conscious product design or is that an area you guys have been working in for a while? The Boex side of our business is focused on commercial interiors from retail spaces to bars and restaurants, but we’ve always used local joiners and materials which are relatively low impact, as we’ve always had an awareness of our environmental footprint, but this is obviously quite far removed from our day to day work. For the last 18 months we’ve been looking at how surfboards are packaged, aware that the industry is only going in one direction with regards to distribution, because there’s more and more boards being sold online and sold internationally. Possibly not as fun to pop, but environmentally and aesthetically superior to materials previously used in surfboard shipping, this is Flexi-Hex. Packaging boards is a problem. 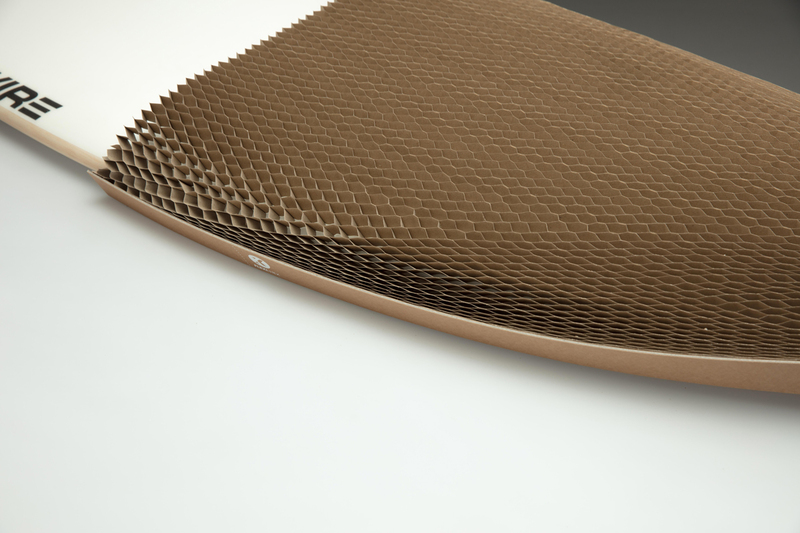 Because of the nature of a surfboard its a convex shape going in two directions, ranging from 4ft to 9ft in length so finding one solution to fit 95% of the board market was a challenge. The idea for Flexi-hex stemmed from seeing how fruit was packed in a supermarket; looking at those foam meshes on mangos and the way they flex around the fruit. There was an environmental aspect but it was also looking at how to improve the aesthetics of the packaging as well, so we were trying to cover all basis. I suppose that’s the imperative of good design now, it’s so multi-pronged; products have to be aesthetically pleasing, useful and environmentally conscious too. Yea, exactly. It’s been really interesting, we have done a lot of testing and speaking to companies and even for those who are environmentally aware, if it’s not meeting a price point where they can sell their product, then there’s no point in even pursuing it. There are so many facets to making a viable product and that’s been a real challenge for us, especially as we get more enquiries from around, we need to be meeting a price point that people are prepared to pay. It’s also been a challenge with an industry which is quite set in their ways on how they package boards. We’ve been trying to re-educate people on how they could potentially save boards, time and money. You’re tackling a small composite part of a much larger environmental issue around overuse of plastic packaging. Do you think in the future individuals and companies coming up with design innovations like this are the way that big environmental issues are going to be solved? I think it has to be like that. It’s impossible to say I’m going to save the world with one solution, but if people start working on small steps in different areas, focusing on how to reduce waste and the environmental impact in their sector or their particular niche market, those dots can be joined together and then the whole culture at large can reduce its impact. Leading on from that, there are some people within surfing who take really drastic steps, Fergal Smith and the boys at Moy Hill Farm are a good example, do you think to really solve these issues we need to make fundamental changes to our way of life or do we just need to shop smarter, recycle more and support environmental innovation? Having known Ferg from being with him on surf trips in the early days of his career, I have a lot of respect for his life direction and the changes he has made are amazing! 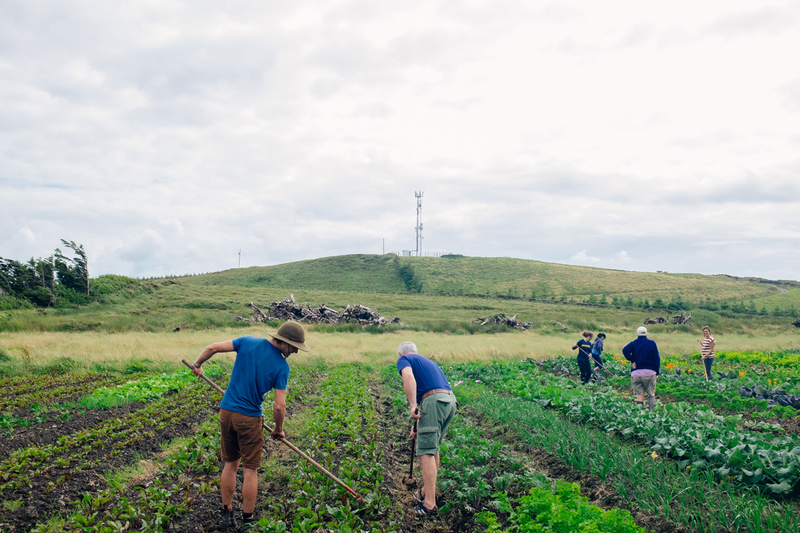 It’s great to see the effect they are having and community they have built around Moy Hill Farm. We all know from personal experience when you start removing technology and clutter from your life and go back to basics by going camping or taking a surf trip you improve your happiness, but the flip side of that is that we all live in a society and culture where you need a certain level of income to enable you to live. For the large majority of the population making drastic life style changes isn’t viable or not necessarily what they are looking for, we also have acknowledged consumerism is wrapped and woven into our culture, so being aware and making smaller steps and ethical decisions as to where and what you buy soon gives strong messages to the larger corporate companies about what consumers are looking for. The cumulative effect of a lot of small changes to systems, technologies, and materials can have huge impact on waste and the effects on the environment. This is what peace of mind looks like as you pack your stick onto the conveyor belt at departures. In that vein, if there’s someone out there with an idea that they think could go some way to solving one of surfing’s environmental issues, what advice would you give to them to go about making that product or getting that idea off the ground? It’s a good question. It’s a hard process to go through because it’s exposing your raw thoughts and ideas and creative thinking to a large group of people. But someone in the office gave me a pep talk in the early stages, her dad was an entrepreneur, and she said he always told her: ‘If you’ve got the idea just make it happen,’ and those words kind of rung true for me. I didn’t want to be at the end of my life thinking I had this idea that I didn’t do anything with, so I thought let’s just make this happen and even if it doesn’t work we’ve given it a go. You learn a huge amount as a person going through the process, it allows you to expand the network of people you meet and your outlook too, so it actually has nothing but positive effects. I imagine it’s the equivalent of a band releasing their album for the first time- that feeling of metaphorically cutting yourself open and exposing yourself to the world it’s a very daunting feeling but quite humbling as well.